Orient Mako is one of the best selling entry-level dive watches now. Up to now, Orient has 3 highly popular products: Mako, Ray (a new version of the Mako), Bambino. While the Bambino is a dress watch with classical look, Mako and Ray are synonymous for their solid appearance as a dive watch. Following is my Orient Blue Mako Review, hope you will enjoy it! The Orient Mako is an outstanding entry-level dive watch, it is affordable but very well-made. Of course, the watch has a few flaws, but it’s still an excellent product in its price range of under $200. In case you grow bored with the watch after a long time of using, you can change the band easily to make it look dressier or sportier. The Mako suits well with almost any kind of watch band, from leather, metal, rubber bands to fabric NATO/Zulu straps. A timepiece from a reputable brand name (Orient is a Japanese watchmaking company with the history of over 50 years). A reliable & durable automatic movement. A sturdy dive watch with dressy look for casual wear. My first impression with the Mako is “What a well-made diving piece, it should have costed me much more!” My Blue Mako is the stainless steel bracelet version, so it is quite heavy. My friends, who are used to quartz wristwatches, felt uncomfortable with the watch’s weightiness at first. However, you will start to appreciate the watch’s heaviness after a short time, because it adds to your solid feel, and make you always remember you’re having a watch on your wrist. You can’t get these experiences with a delicate timepiece. The Mako is rather thick (13mm), but it’s not too large (41.5 mm of dial size, not included the crown), if you want a bigger watch, you can try the Orient Mako XL, it’s the 44mm version of the original, with a few changes in design to look sportier and more forceful. I myself prefer the original design as it is sturdy and elegant simultaneously. The original Mako is a versatile timepiece, the XL is more of a sport watch. Although the XL version is a little more expensive than the first Orient Mako, they both use the same automatic mechanical – the 46943 caliber. In the price range of under $200, the Orient Mako is among the bestsellers, beside the Invicta pro divers and Seiko automatic dive watches. What makes the Mako popular is its dial design. As so many other watchmakers tried to copy the appearance of the Rolex Submariner, Orient dared to think out of the box. You can see Rolex- similar details on the Mako, but when you look at them side by side, you cannot say that they use the same design cues. Orient offers you 5 choices of color for the Mako: black, blue, orange, yellow and pepsi (red/blue bezel). The black and blue versions are the most popular. As for the Blue Mako, its dial background looks virtually black in low-light conditions. Interestingly, the dial gives off a shimmering navy blue when being exposed to a direct light source. The Black Mako is not really black, but charcoal-gray indeed. Although its matte face can’t get shiny like the Blue Mako, it’s still very charming in its own way. The Arabic numberals at the position of 6,9,12 are highlights on the Mako’s face, combined with the sword-shape hour and minute hands, they form a nice looking dial. The Orient logo adds a retro style to the watch. The red thin sweep hand contrasts very well with the dial, making people notice its smooth movement each time they look at your watch. With the Mako, you have the day&date displayed on the 3 o’clock aperture, which is quite convenient. As I said, the Mako is a dive watch with dressy appearance, so the bezel cannot be placed higher than the crystal like that of Seiko dive watches. It is rather thin and beveled, nice-looking but easy to slide off your fingers when you rotate it, because the grooves on the edge are too small for your fingertips to take a good grip. Fortunately, my Mako’s bezel is not so hard to turn like many other people complained, maybe Orient has fixed this problem. It was a little stiff at first, but the bezel quickly loosened up after a few times of using. For those who are concerned with precision, Mako’s bezel is 60-click, not 120. I don’t mind because I’m in no need of extreme accuracy. One more thing, if you see the lumed pip doesn’t line up well with the 12 o’clock marker, it’s okay as every Mako is just like that, the pointer is about 2/10 minute off center. The Mako seems to be a little smaller than many other sport watches because its case is just 40mm (not included the crown), but it can fit well with any size of men’s wrist. It’s rather thick (13mm) and weighty due to the automatic mechanical inside, and this is the factor that makes the case seem so substantial. It’s so well finished despite the fact that it’s made in China (Hong Kong), not Japan, some Orient watches are 100% “Made in Japan”, but many other are cased outside of Japan, mine is an example. Orient controls their products quality very well, so there is no difference. The case is brushed on surface but polished on both sides, its back is made of stainless steel,not see-through mineral glass, so you can’t see the caliber running inside. What a pity! Looking at the heart of your watch beating below the glass is a thing of joy. The Mako has a screw-down crown at the 3 o’clock position, and a pusher at the 2 o’clock. The pusher is simply to change the day, and the crown is for time & date adjustment. The lugs are inwardly curved to make a smooth transition point with the bracelet. Personally, I don’t like boxy-body watches which have a big case but small lug width, look disproportionate and disaggregate, luckily, the Mako is not one of them. The Mako has an eye-catching dial and case, on the contrary, its bracelet received some unfavorable feedback. The Mako basically has 2 versions: the stainless steel bracelet and the rubber strap. Users were satisfied with the rubber strap due to its high-quality material and sporty design ( but I don’t like the double-dolphins logo on the strap as it looks too childish). This version is a little cheaper than the metal one. The stainless steel bracelet, on the other hand, has no focal point, and looks rather cheap, according to many users. Although the bracelet feels solid, its brushed surface has nothing for you to focus on. I think the Japanese watchmaker did nothing wrong with their watch band, however, because the case and the dial is so well-made, customers feel that a characterless metal band would degrade the Mako’s classy externals. That’s why Orient made a small change with the Ray. Its bracelet has 2 thin polished lines running along the inner links. The customers are very pleased with Orient’s change as the new band adds a point of interest that its predecessor lacks. I think it would even better if Orient applies this new bracelet to the Mako since this watch looks dressier than Ray, but it seems that they don’t want to upgrade the Mako. In case you want to try another band material, you can replace the stainless steel bracelet with a genuine leather or fabric NATO/Zulu strap, the watch would look very beautiful and total different. As I love the solid feel, I will stay with the ugly metal band for a while, but I will change for a calfskin strap someday. The Mako is a reliable diving piece, you can go scuba diving with it. Although Orient didn’t get an ISO 6425 (water resistant standards for dive watches) certification for their Mako like Seiko did for SKX series, many personal tests with pressure tools have shown that the Mako & Ray meet all needed waterproof standards for a real dive watch. The only problem here is that the bezel is installed about 1mm lower than the mineral glass, and Orient’s glass is a tad brittle. This means you must be careful when diving under water with the Mako because if your beloved timepiece unexpectedly collides with something, the glass might get scratched and water will get into your watch immediately. Seiko usually places the bezel much higher than the crystal to avoid such situations like that, but it costs their watches a gentle look, Seiko dive watches are not so dressy as Orient’. When it comes to the lume, it’s not Orient strong point. You can see Mako’s luminous hands and hour marks in total darkness without any problem, but it cannot stack up against Seiko dive watches such as the SKXs or Monsters, both in light intensity and longevity. However, I think Orient did their job well as I’ve seen many other dive watches, which cost you 2 or 3 times the price of Mako, have a poorer lume. The Orient Ray gets a little upgrade of lume, slightly better than the Mako, but only average at best. In the budget price range, you often see watchmakers outsource their watch parts to other companies, especially automatic calibers, which are complicated to produce. However, Orient has choosen to make and assemble their own movements in-house, they show their craftsmanship by being directly involved in creating the heart of their timepieces. The heart of the Mako, Mako XL and Ray is the caliber 46943, it’s a reliable self –winding mechanical, non- manual, non-hacking. The sweep hand can’t be hacked is not a real matter because most users who choose an automatic watch accept the fact that their watch can’t be perfectly accurate, or else they will take a quartz or digital wristwatch. The caliber 46943 is simple-structured, it just has 21 jewels and a frequency of just 6 beats/second (21.600 beats per hour), not so high compared to some affordable automatic movements made by Miyota or Seiko. However, you will be pleased with its accuracy, my Orient Mako can keep time within +9,10/-9,10 seconds per day. Some people also reported that their Mako runs about -5/+5 seconds per day, I’ m not lucky enough to get an exceptional Mako like that. As you can see, this level of accuracy is very rare in the price range of under $200. 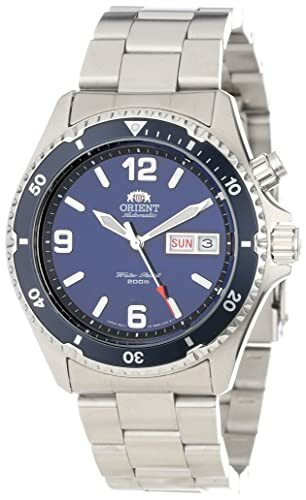 In fact, Orient honestly stated that the Mako can only keep time within 20 to 25 seconds a day, so users don’t expect too much, but in reality, the watch outperforms their claim. The movement structure is simple, but its true performance is outstanding, and the low beat rate means your watch can stay with you for longer. As the Mako is a self-winding watch, you have to wear it at least every other day because it just has 40 hours of power reserve. The Orient Mako is an outstanding entry-level dive watch, it is affordable but very well-made. Of course, the watch has a few flaws, but it’s still an excellent product in its price range of under $200. In case you grow bored with the watch after a long time of using, you can change the band easily to make it look dressier or sportier. The Mako suits well with almost any kind of watch band, from leather, metal, rubber bands to fabric NATO/Zulu straps. For more customer reviews, check out at Amazon!